We offer for sale hand made collars and leashes for all breed. We specialize in breed of bull types and first of all in staffordshire bull terriers breed. 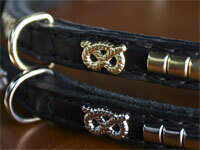 We offer collars and leashes with typical symbol for this breed - pretzel. No machines are used or ugly rivets. Every of these products you can order solely through the e-mail info@sladeczech.com and the payment must be done beforehand ( from a reason of the receiving order). Thanks for being suportive. The prices are individually according to length and width of the products (about 30 Euro). The price doesn´t include a postage - collect on delivery.